"If the Sri Lanka government tries to wage war against us making use of Karuna, there will be serious repercussions and we will not hesitate to take appropriate action," he said. 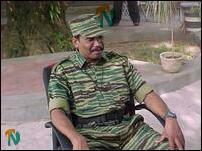 Col.Ramesh said that four senior women cadres including the military and political wing leaders who were with Karuna have re-joined the LTTE early this week. He said that these cadres will very soon disclose details about Karuna’s action when these cadres address the reporters soon in a press conference. He said the Sinhala media in the South and some English media including foreign agencies with Sinhala reporters, were spreading distorted information about the LTTE during the days of war. Even during time of peace they are continuing to do the same thing. Some Sri Lanka military personnel still do not want to see the dawn of peace, Ramesh added. "They think by doing so they could create divisions among our people. But the people have already identified the sections of the media who are spreading these news. Our people have become politically savvy to filter the facts from propaganda, he said. He said the LTTE is functioning under an able and experienced leadership and is marching forward in a truthful and committed path towards attaining a fair and just solution to the Tamil liberation struggle. Ramesh added that although certain incidents have taken place in the cleared areas, including shooting death of members of the LTTE, these incidents will be brought to a halt very soon.